I am a single mom that is working very hard to care for my family including our cat Boots. An ugly custody battle has left me in a tight financial situation. Our cat, Boots, has two white back paws and a heart of white on his chest. 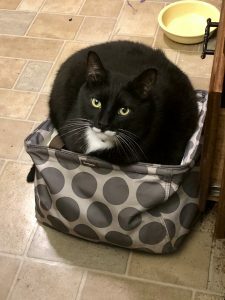 He is a heavy cat, somewhat of a carb hog, so he has had supervised eating for some time. He is on prescription food from a urinary problem early in his life, which we were told is common for male indoor cats. He is the most handsome adorable cat and I am trying to raise the funds to treat him in this emergency. He has a urinary blockage and is at the ER where they are trying to help him. I do not have enough for the surgery and am reaching out for help to see if catheterization and medication overnight can resolve the blockage. I am very grateful for any assistance for our family. Thank you for listening and caring!